Soul Poles is a Park City, Utah, based pole and accessory company with a dedicated focus on sustainability. Their poles are built with bamboo that offers a claimed durability twice that of aluminum, and is backed by a two-year shaft replacement warranty. Stylish, sustainable and simple – characteristics sought by many of today’s discerning skiers. 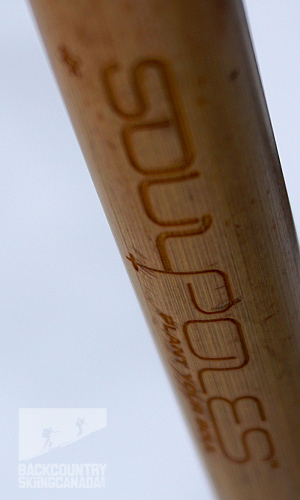 Former US Ski Team members Erik Schlopy and Bryon Friedman founded Soul Poles. 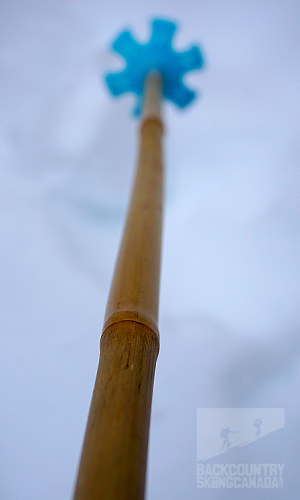 After going through hundreds of poles during their racing careers, they envisioned bringing back the bamboo as a “moral imperative.” The duo researched bamboo from around the world (there are over 2,000 different species of bamboo) and found some of the strongest in rural China – sturdy enough to stand up to the rigors of skiing. 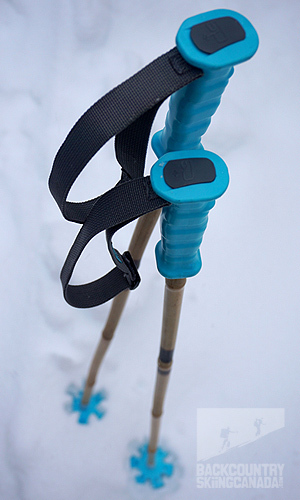 Soul Poles makes their product in-house in Park City. In their words, they produce “climate change icon products driven by a shared passion to raise awareness around the challenges caused by reduced average snow packs, water supplies, and increased storm strength and infrequency in our mountain communities.” Soul Poles is an active participant in Protect Our Winters (POW) and 1% For the Planet. Have a broken pile of poles at home? I do, and for this reason I was keen to get my hands on a pair of Soul Poles and put them to the test. Soul Poles come in an impressive collection of styles and colour options, as well as a full customizable program that allows you to have your name (or what-have-you) engraved on the pole. Their “art” series by R. Nelson Parrish are pretty fly too. There is even an option to go to the factory and hand-build the poles your self, or participate in their “travelling workshop” that visits major ski town across North America. 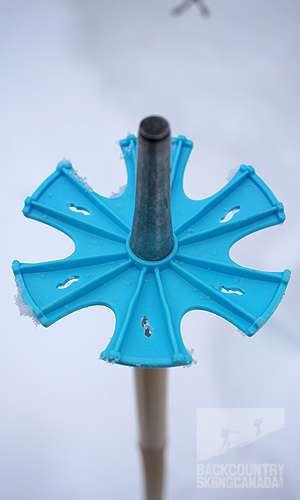 Soul Poles baskets and grips are made from recycled plastic and are available in a standard and a powder size (our option). 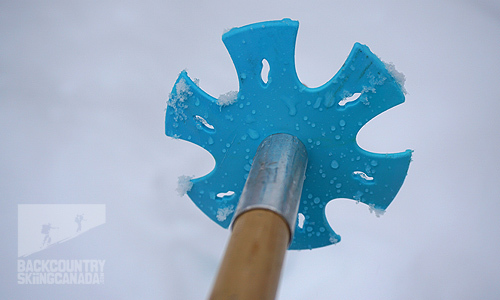 The pole tips are made from machined aluminum with a steel tip for maximum grip on hard surfaces. The leashes are woven from recycled PET plastic yarn. The bamboo is inspected to meet strict size, quality and aesthetics, then cut to length and kiln-hardened to perform best in cold climates, and finished off with penetrating oils to give a luster and protect the bamboo. From there, the poles are machined to fit the tips and grips, painted (or not) and are assembled for the finished product. First off, these poles are cool. They’re stylish, stand out and are talking sticks when on the lift. While recent seasons have seen banner sales for Soul Poles, in our far-flung area of the Kootenays they aren’t yet as popular and they’re certainly a conversation piece. Functionally, the Soul Poles are somewhat heavier than aluminum poles, but considerably heavier than carbon fiber, adjustable touring poles. 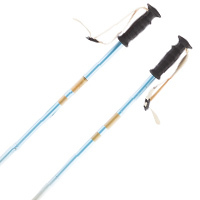 While I was perfectly comfortable on the hill and slack touring, I still grabbed my old touring poles for long walks. 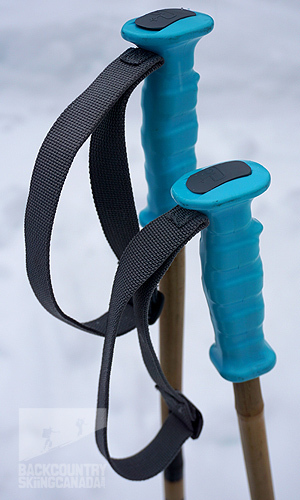 However, Soul Poles recently doubled a KickStarter funding campaign to build a new “SoulLite” ski/hiking pole with a new pistol grip shape and overall lighter weight. The small gripes I do have with the Soul Poles are the grip ergonomics and the lack of a removable leash. The grips are a fairly “traditional” design and my experience with many other pistol grips equates to greater comfort and control. Mind you, this is a personal thing and people with different shaped hands may not feel the same way. 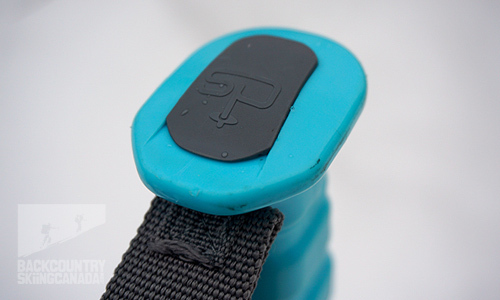 The second issue is the leash, which is a no-frills affair and, due to the way it’s fixed to the pole, is almost impossible to remove – something I prefer in the backcountry. It would be nice to have the option. In the few months I’ve tested the Soul Poles I have zero issues with the construction or the durability of the bamboo. They are aesthetically pleasing, unique and offer a flair of creativity and personal expression. While there may be a slight weight penalty, this was less of a concern on all but longer tours (and if that’s what you’re looking for the new SoulLites may be the ticket). Package all of this into supporting a company that holds environmental sustainability and consciousness at the top of their priorities, and Soul Poles are worth consideration.